Classical Grandeur and Caribbean Flair on Magnificent Grace Bay Beach! Beach Villa Paprika, Providenciales (Provo), Turks and Caicos Islands. 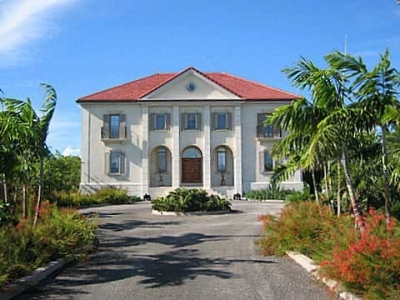 A grand Caribbean manor house which appears to have stood for centuries but was only completed in 2005! This magnificent vacation villa is luxuriously appointed with all modern luxuries and conveniences. The pool terraces of this holiday villa are surrounded by an iron railing making it easy to keep an eye on the younger ones in your holiday group. Beach Villa Paprika is almost completely surrounded by lush and colorful landscaping. Beach Villa Paprika has a very large freshwater pool, a separate kiddie's pool, gazebo, folly and a large coral stone tiled terrace. The coral stone's light, natural color keeps it from getting too hot for your feet and its natural texture provides a non-slip surface where you will find yourself walking atop interesting, million-year-old fossils. The folly at this Caribbean vacation villa contains a propane BBQ grill for casual, culinary delights and also a bar for cooling your favorite refreshing drinks while on vacation. Beach Villa Paprika's pool area has both large open terraces for soaking up the holiday sunshine and cooler, covered terraces for dining or simply relaxing in the shade. You can enjoy wonderful views of the ocean from just about everywhere at this vacation villa rental! Beach Villa Paprika's gazebo is ideal for relaxing in the shade, enjoying the view of the ocean or watching a beautiful sunset. This holiday villa has a grand and beautiful living room with marble floors, arched doorways and a beamed ceiling. The sitting area comprises comfortable and tasteful furnishings. Beach Villa Paprika's living room provides some very distinct contrasts with an exceptionally large, state of the art, 55 inch flat panel TV, which is decently concealed in an antique French armoire. The French armoire also contains a VCR and DVD. High speed wireless Internet access is also provided at no extra charge. This vacation villa's dining area has tasteful, rustic charm and the large hardwood dining table comfortably seats 10 people. If required an additional table can seat 4 more people. Beach Villa Paprika's terraces provide generous space and seating should you prefer to dine alfresco. Beach Villa Paprika has a large but charming kitchen with hand rubbed ash cabinets and all the modern kitchen appliances you could possibly need while on holiday. However, if you would like to dine out there are 6 restaurants within easy walking distance. Even the upper hall of this holiday villa, which leads to 3 of the bedrooms, is tastefully decorated with carefully selected furnishings. * Our full time island management staff is on hand to answer any questions and assist with any optional arrangements or reservations such as restaurants, fishing, sailing, tours, chef, etc. * Daily maid service includes only making the beds, washing dishes, and cleaning bathrooms. It does not include changing bed linens, changing towels, baby sitting, cooking, nor any personal laundering. Washers and dryers are in the villa for your personal use. Beach Villa Paprika has 5 luxurious master bedrooms. 3 master bedrooms with a king size bed and 2 master bedrooms with 2 king size beds. There is also a 33 channel cable TV in each of the spacious bedrooms. Each bedroom in this vacation villa rental has large French doors which open onto a private deck affording beautiful views of the pool, terraces, gardens, beach and ocean. All bedrooms at Beach Villa Paprika have a large, private, en-suite bathroom with double vanity, large wall mirror, magnifying mirror and hair dryer. There is also a large walk-in closet with wooden coat hangers in each of the bedrooms. The bedrooms of this luxurious holiday villa in the Caribbean have all been individually decorated giving each its own subtle character, but all have furnishings of exceptional quality in common. NOTE: The Turks and Caicos government requires that a 10% tax be paid on all vacation villa rentals and this cost must be added to your final payment. Note: The air conditioning is metered in order to discourage use with the doors and windows open. It is not expensive if used judiciously and you are not charged for the first $150 per week in usage, after which there is a charge of 28 cents per kilowatt hour. There is a separate, easy to read, digital AC meter in the laundry room where you may monitor AC usage if you wish. There are 8 separate air conditioning systems in this holiday villa, so you only need to cool certain parts as needed. Beach Villa Paprika gets a comfortable, almost constant trade wind, so it would be rare to exceed the AC allotment during your vacation. This holiday villa is located on the much sought after western, residential end of Grace Bay Beach in the Turtle Cove area of Providenciales (Provo). Beach Villa Paprika is within easy walking distance of good restaurants and the marina offering fishing, diving, tours and some limited shopping. Beach Villa Paprika is literally only footsteps away from the magnificent white sandy beach where you can walk for miles and miles. Smith's Reef with some of the best snorkeling the Turks and Caicos Islands have to offer is also right outside your door.